She’s the most highly-coveted submissive the Castle has ever known. She never says no, never cries her safeword, and never plays with the same Dom twice. For years Alan has watched her, always looking but never allowed to touch until the night the Castle hosts its first ever charity auction. 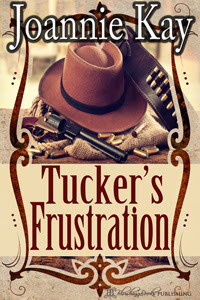 Seizing his chance, Alan bids, but defeating the other Doms in the audience is only the first and easiest step in his bid to own the infamous O.
Joannie Kay tells three separate stories of love in Tucker’s Frustration. Tucker Warren is in love with Victoria Lawrence, but all the two do is fight. She owns the town’s one and only saloon, and it is a source of never-ending trouble for the Sheriff. He also has a niece who is forever pulling pranks with the help of her friend, Caroline. Once the two younger women are married, perhaps Tucker will be able to turn in his badge and deal with Victoria in the way his heart desires. Upholding the Law by Laurel Joseph tells the story of Mac Keller and the undercover marshal who is nearly lynched on Keller land. JC Porter is grateful to the lovely woman for saving his life, but if she were his, he would spank her for putting herself in such a dangerous situation.